Pot Roasted Cockerel | Packington Free Range | Born and reared outdoors. Always. This hearty Pot Roasted Cockerel is an easy no fuss way to feed the family. The flavour of the chestnut mushrooms combined with baby sweet corn and roasted banana shallots fuse together slowly in the pot making it a convenient way to bring a full and heart-warming taste to the table without putting in much effort. Place the leek, carrot, garlic & onion in the bottom of a deep casserole dish or deep roasting tray big enough to take the cockerel. Rub the skin of the cockerel with oil and season with salt and pepper, and then lay the bird (breast up) on the vegetables. Put in a pre-heated oven (gas mark 6) uncovered and cook for 20 – 30 mins to colour the skin and seal in the juices. Add the herbs and wine, cover the dish with a tight-fitting lid or a double layer of tin foil crimped tightly to the dish and return to the oven for 30 mins. Remove from the oven, take the lid off and baste the bird with the juices from the bottom of the dish. Add the stock, mushrooms & corn and re-cover the dish and return to the oven for 45-50 mins. Heat a little oil in an ovenproof dish and add the shallots, season with salt & pepper and place in the oven for 20-30 mins until soft to the touch and golden brown. Keep warm. After 45-50 mins have elapsed remove the cockerel from the oven and remove the lid. Test to see if the bird is cooked by pushing a skewer into the thickest part of the leg, remove the skewer and look at the colour of the juices that flow out if they are clear then the bird is cooked (if they are pink then it isn’t cooked and the bird needs to go back into the oven to finish off the cooking, testing every 10 mins). Once the bird is cooked, carefully lift it out of the dish onto a serving plate big enough to hold the bird and the garnishes and keep warm for 20 mins to allow the meat to rest and the juices to be absorbed into the meat. Take out the mushrooms and the corn and keep warm with the cockerel and the shallots. Strain the juices into a saucepan and allow to settle for 5 mins to allow any grease to rise to the top. Carefully remove as much of the grease as you can with a small ladle or spoon. Put the cooking liquor on the stove and bring to the boil, thicken slightly with fecule or granules, correct the seasoning and pour into a sauce jug. 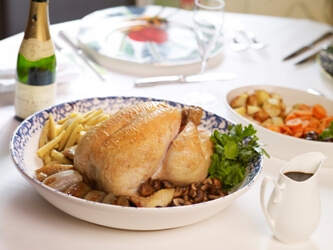 Remove the cockerel from wherever it has been keeping warm and pour any juices from the plate into the jug, arrange the mushrooms, corn & shallots around the bird and serve with your choice of potatoes and fresh vegetables.